What do you do when the thing you like drawing least (in my case it’s cars) is front and centre in your scene? There are two choices available to you: move where you are or stay and deal with it the best you can. Today on my way to school, I had this very situation. I parked on a street near my house with a beautiful row of maples, but blocking their trunks were two cars. With only an hour to sketch, moving was not option. That would have used up all my precious sketching time. Instead I decided to try to find a way to unobtrusively integrate the cars into my sketch. 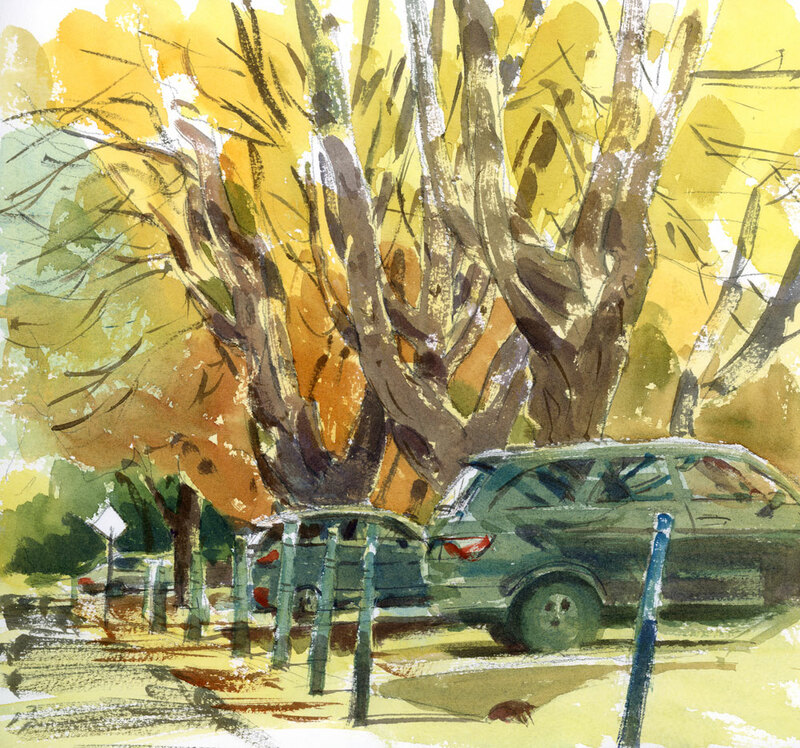 I wasn’t quite sure how to best combine both the gentle shapes and flowing lines of the trees with the shiny, reflective, angular cars, and in the end decided that judicious use of colour would be my best option. Instead of dipping into the full range of colours on my palette including dark blues and greys for the cars, I chose a limited range of pigments: Naples Yellow, Translucent Orange, Cerulean Blue and Cobalt Blue. I’m always surprised by how harmonious the mixes will be when you only use a few pigments. And I think that because it’s very hard to get deep darks with any of these colours, I avoided making the cars overly obvious. Also please note something new in the suburban landscape this week: the vertical driveway markers put up by the snow clearing companies. A sure sign of changing weather. During the week I don’t get much of a chance to paint outside because I arrive home too late in the day. But I do take the dog to the park for her daily run and this week, as I have mentioned in other posts, the light is spectacular, so I have been taking phone photos that are great reference material for watercolour experimentation. A few years ago when I took a workshop with Tom Hoffmann on Lopez Island, he had us work out problematic areas in a painting by practicing small sections first. I think that’s a great strategy because if you’ve already worked out where you might run into a mess (and dealt with it in advance), then you have a much better chance of success when you finally get around to painting. With that in mind, I came home from the park and, using my reference image, made a small (and quite simplified) sketch of what I think might be difficult to tackle in a larger painting: the trees half in light and half in shadow. I think playing around with the colours and values of this will come in handy if ever I decide to take this to the next step by turning it into a larger watercolour. The other day when I was out painting the colours of the autumn trees along Lac St. Louis, I went down to the edge of the water to take some photos of the dramatic late day lighting on the boats. When I turned around I saw four men at easels, painting the same scene in oil. Of course I had to go over to see what they were doing, especially since I know most of the local artists. As I approached, I realized both that I didn’t know them, and that they were serious painters, dressed for the blustery weather with heavy hooded parkas, fingerless gloves and boots. I tried asking a few questions but they seemed more intent on capturing the scene in the quickly fading light than on talking. I probably would have been too. There was also a language barrier since they were from Taiwan and didn’t speak much English. It seemed amazing to me that there were painters from the other side of the world, painting in my local spot near the lake. I’d love to know who they were. If you know anything about them, please share it with me. I could see from their canvases that they were not beginners, and I would love to see what the finished paintings look like. I didn’t brave the cold and wind like they did. 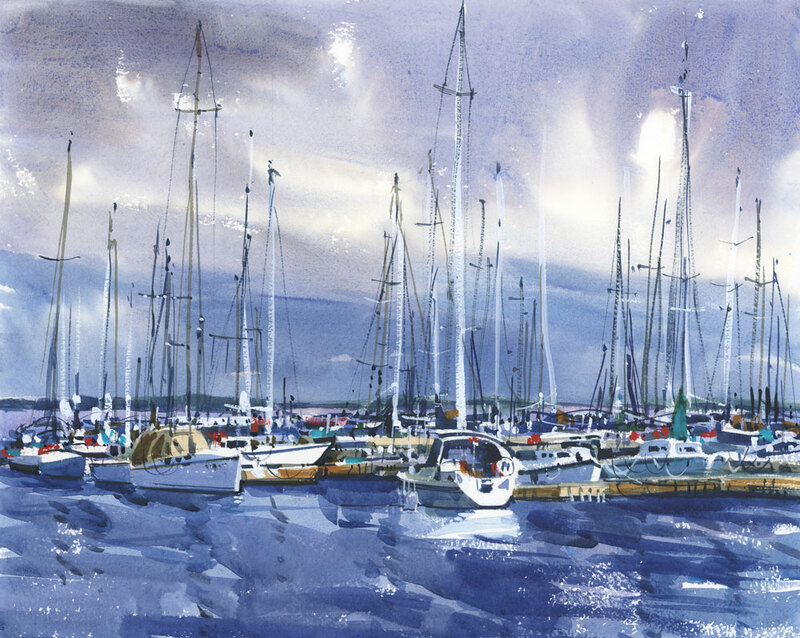 My rendition of those boats on a blustery day was done in studio. Painted on Two Rivers Papers, Rough, 140 lb. 16″ x 20″, watercolour and white gouache.